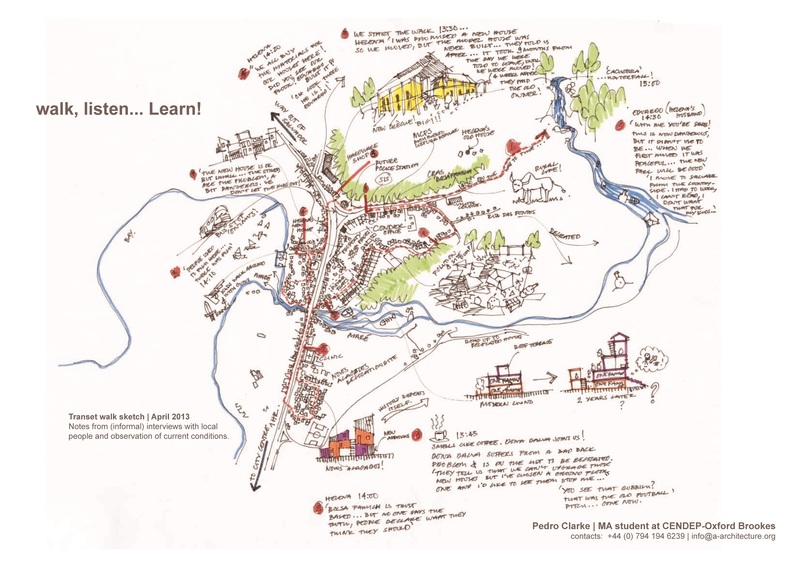 The second UK Shelter Forum PechaKucha, hosted by University College London, brought together practitioners and researchers in order to share learning and develop networks for future collaboration. To apply for a place to present at the PechaKucha participants submitted posters. 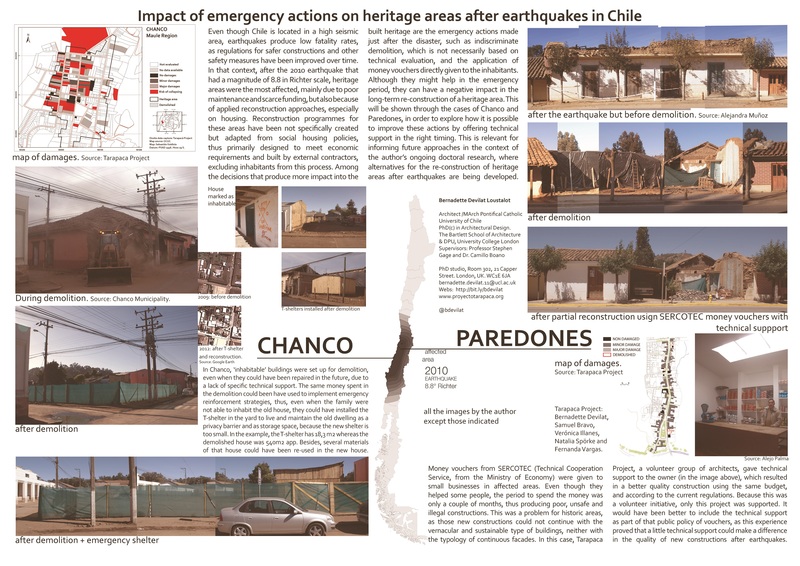 Using the PechaKucha format of 20 slides each shown for 20 seconds, ten speakers then presented their research into different aspects of shelter, settlements and disasters. Why have our designs not had an impact in practice? Architectural practices, engineering firms, and manufacturers have been ingenuous when designing shelters without repercussion in the field. Why have these innovative solutions been widely published but not used? It is argued here that because they are trying to answer the wrong questions. 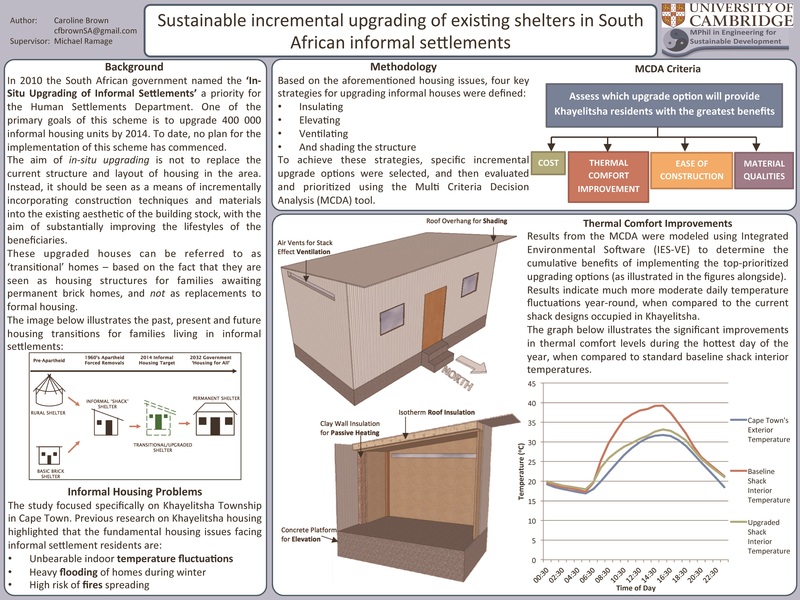 This presentation will show a comparison of T-shelters developed in the past ten years in order to start a debate about the differences between used and not used designs. Based on my own experience I will discuss possible reasons for the gap between academia and practice, and will elaborate some ideas for a better collaboration and dialogue. Housing and sanitation are often approached as two separate problems. 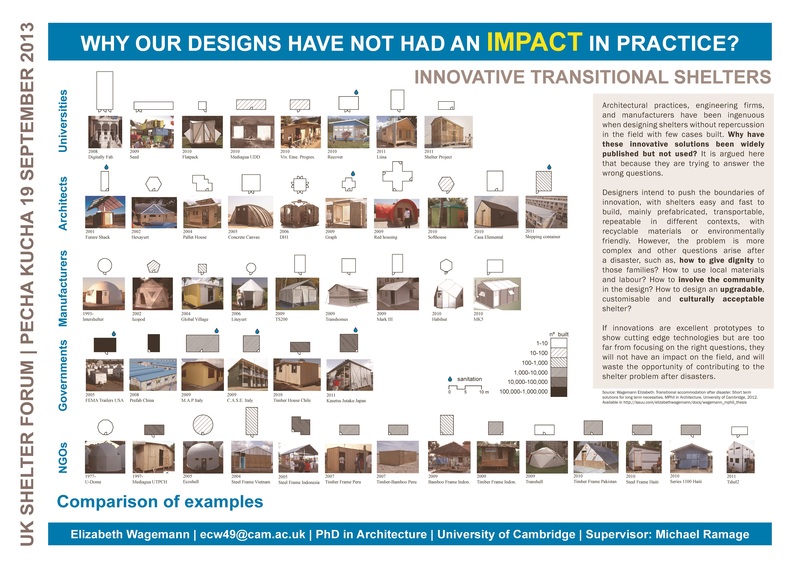 With much debate surrounding the equitable and inclusive design and procurement of housing this often falls short of addressing how this connects with infrastructure. Schemes often represent sanitation as a dotted line assuming this will magically come. Little research looks at the existing housing economy through the lens of the provision of services. 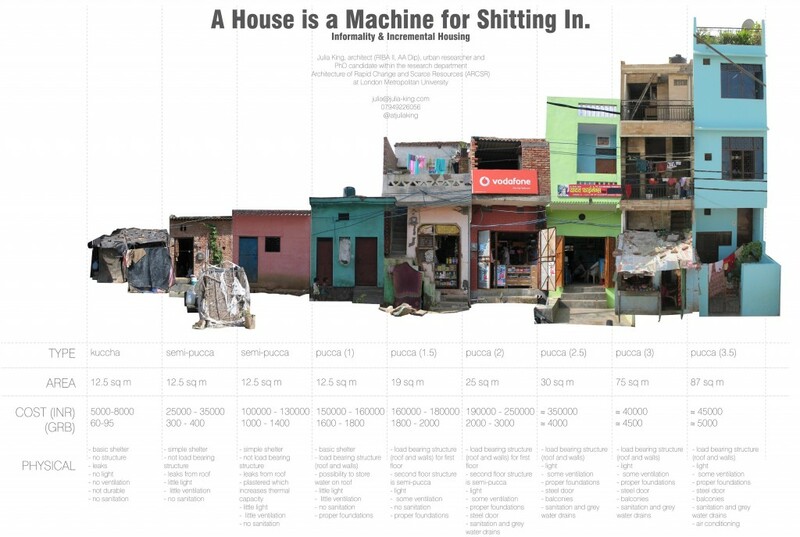 This presentation will present two projects addressing the role of sewerage and water in relation to the self-built informal and incremental housing stock which has come to define the mega-cities of the global south. 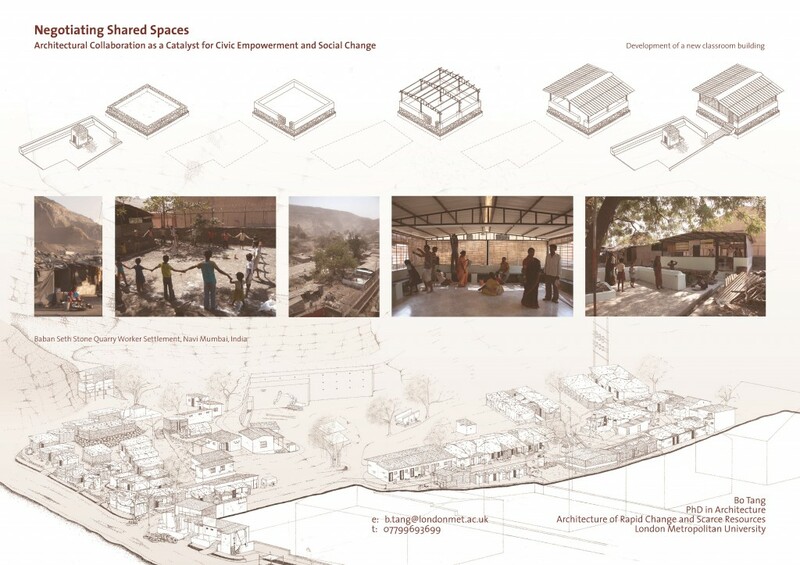 Bo presented a classroom building project in a stone quarry worker settlement in Navi Mumbai, India as a case study for demonstrating the notion of architectural collaboration as a catalyst for civic empowerment and social change. At stake is a more concrete and nuanced understanding of the nature and settings of what is too-often generalised as ‘public space’. The provision of amenity buildings and post-hoc infrastructure creates situations of negotiation with constituents, who in turn develop a civic commitment and solidarity in the course of the work. These negotiations depend upon subtle and rich cultural contexts, which become evident during the course of the project, and which properly characterise ‘public’ in this non-Western culture. In this way the project is a vehicle of research and understanding, not an application of a theoretical approach divorced from the concrete conditions. 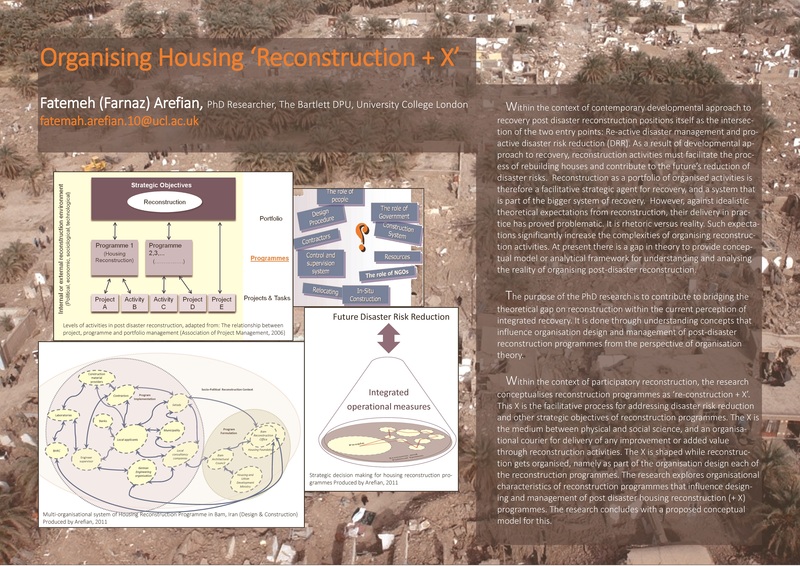 My research is relevant to any reconstruction or upgrading scheme working with an existing neighbourhood. 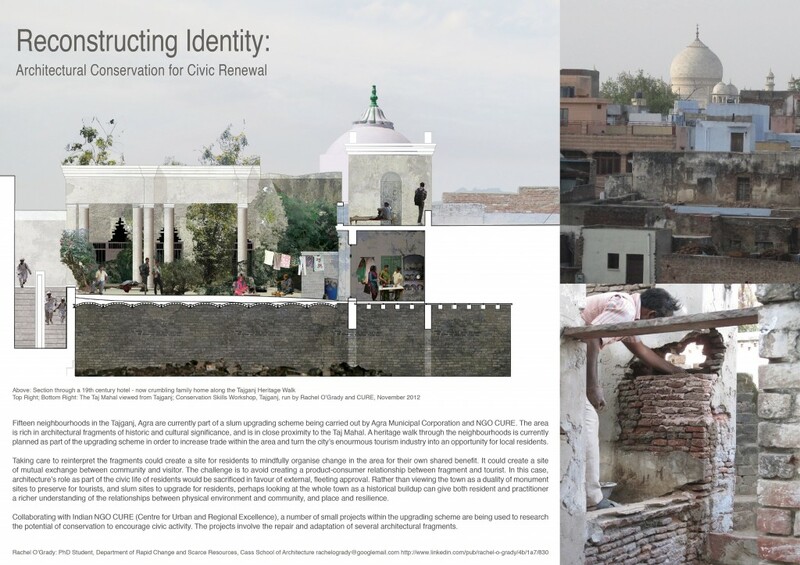 Working within a ‘slum upgrading’ scheme in Agra, ‘cultural heritage preservation’ has been defined as one of six project goals by government. In terms of planning, monuments become the focus, but what is the real relationship between heritage and the physical environment? Rather than treating conservation separately to the other goals, looking at the whole project in terms of continuity and change could start a discussion with communities about what their environment means to them, which aspects of it support ‘community’, and which elements increase vulnerability. Chilean heritage areas were the most affected after the 2010 earthquake (8.8 in Richter scale), mainly due to poor maintenance and scarce funding, but also because of applied reconstruction approaches. 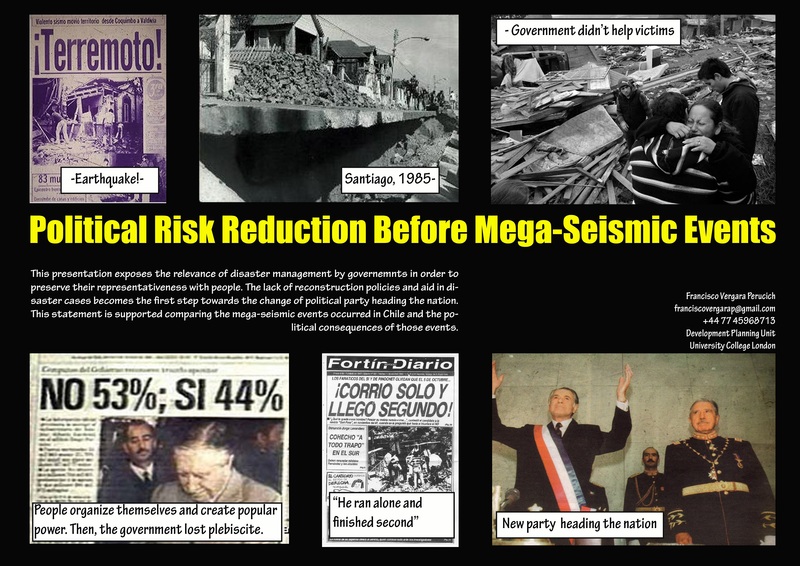 Among the decisions that produce more impact in them and in the long-term re-construction, are the emergency actions made just after the disaster, such as indiscriminate demolition and the application of money vouchers given directly to the inhabitants. This will be shown through the cases of Chanco and Paredones, in order to explore how it is possible to improve these actions by offering technical support in the right timing. This presentation exposes the relevance of disaster management by governments in order to preserve their representativeness with people. The lack of reconstruction policies and aid in disaster cases becomes the first step towards the change of political party heading the nation. This statement is supported comparing the mega-seismic events occurred in Chile and the political consequences of those events. At present there is a gap in theory in that it lacks of a conceptual model or analytical framework for understanding and analyzing the reality of organising post-disaster reconstruction programmes, which are complex and usually encounter problematic practicalities. The research addresses this gap by investigating organisation design and management for post disaster reconstruction programmes which are participatory and aim to contribute to the future disaster risk reduction. The focus is on urban housing reconstruction programmes. The presentation will share some of the research findings alongside with some empirical examples from housing reconstruction in Bam which the researcher was a participant observer. 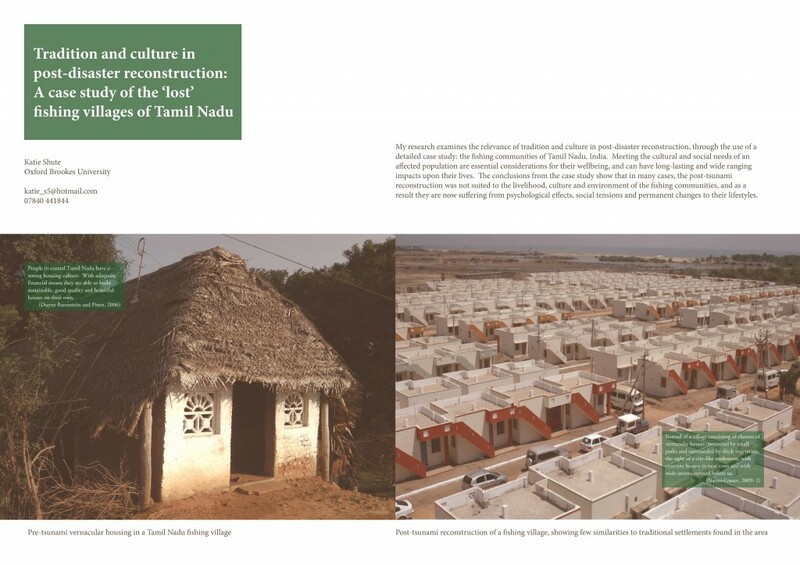 My research examines the relevance of tradition and culture in post-disaster reconstruction, through the use of a detailed case study: the fishing communities of Tamil Nadu, India. Meeting the cultural and social needs of an affected population are essential considerations to their wellbeing, and can have long-lasting and wide ranging implications upon their lives. The conclusions from the case study show that in many cases, the post-tsunami reconstruction was not suited to the livelihood, culture and environment of the fishing communities, and as a result they are now suffering from psychological effects, social tensions and permanent changes to their lifestyles. Sometimes you fall upon things. The talk will focus on the observation (and the findings) of a (short) 10 day initial research trip to Parque S. Bartolomeu in Salvador da Bahia, Brasil where we are working with a local organization on upgrading their current facilities and assisting as well as providing support on the programmatic side. The purpose of the trip was not to (formally or informally) evaluate anything, but knowing that I was going to be in an area where a large World Bank funded scheme was about to be completed I asked (and was allowed) to go and visit the project. The stories I was told and evidence I collected are obviously anecdotal, but the experience was eye opening! This event was organised by Victoria Maynard, Laura Heykoop, Bernadette Devilat and Chris Sinclair with funding from the Public Engagement Unit at University College London.